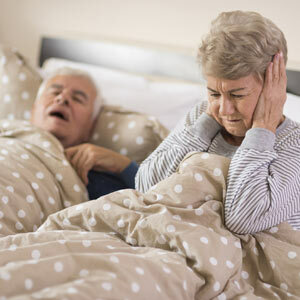 Fatigue, irritability and family complaints about snoring — all tell-tale signs you may have sleep apnea. There’s more to this condition than being grouchy the next day — the long-term effect could increase your risks for life-threatening diseases. But how do you know if you actually have sleep apnea? And if you do, what can you do about it? Undergo an exam by a physician trained in “sleep medicine.” Sleep apnea occurs when the airway becomes blocked while you sleep, dropping the body’s oxygen levels; your body awakens to re-open the airway. The event may only last a few seconds, but it can occur several times a night. Even so, sleep apnea is one potential cause among others for snoring or fatigue. To know for sure if you have sleep apnea you’ll need to undergo an examination by a physician trained to diagnose this condition. He or she may then refer you to a dentist to make a sleep appliance if you have mild to moderate apnea. Determine the level of your apnea’s intensity. Not all cases of sleep apnea are equal — they can range in cause and intensity from mild to advanced, the latter a reason for concern and focused intervention. Your physician may use different methods for determining the intensity of your case: review of your medical history, examining the structures within your mouth or having your sleep observed directly at a sleep lab. Getting the full picture about your sleep apnea will make it easier to develop a treatment plan. Match the appropriate treatment to your level of sleep apnea. If you have moderate to advanced apnea, you may benefit from continuous positive airway pressure (CPAP) therapy, an electrical pump that delivers pressurized air through a mask worn while you sleep that gently forces the airway open. It’s quite effective, but uncomfortable to wear for some people. Advanced cases may also require surgery to alter or remove soft tissue obstructions. If, you have mild to slightly moderate apnea, though, your dentist may have the solution: a custom-fitted mouth guard that moves the tongue, the most common airway obstruction, down and away from the back of the throat. If you suspect you may have sleep apnea, see a trained physician for an examination. It’s your first step to a good night’s sleep and better overall health.